What’s all this about a #verbathon? I teach English in France to 11 to 15 year olds. I have three hours a week with each class. For two hours a week we are doing exciting project work where all kinds of skills and learning can be seen. Visit our virtual classroom to find out more. 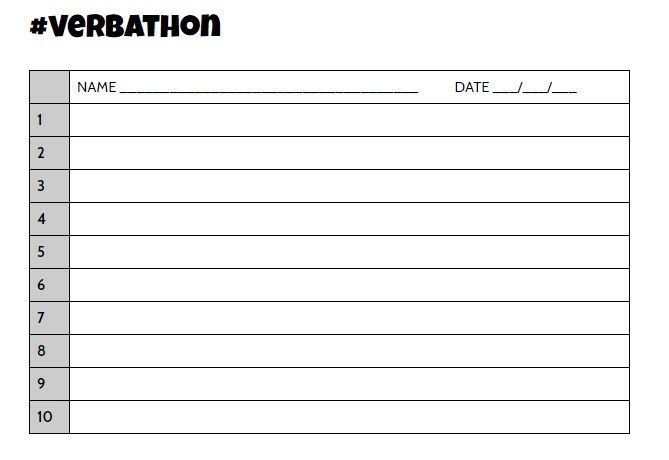 For the third and final hour we are working and playing with the #verbathon which on twitter looks like this. A list of 100 irregular and commonly used verbs built into phrases in association with various auxiliaries, modals and varying sentence structures. Comparatives, questions and modals all jostle together in these 100 phrases built around the English language’s most common and yet so irregular verbs. Even #growthmindset vocabulary has been built in. Every week using game play and strategy, students discover, rediscover, manipulate and create new phrases and structures around these verbs. I usually have around 24 students per class. 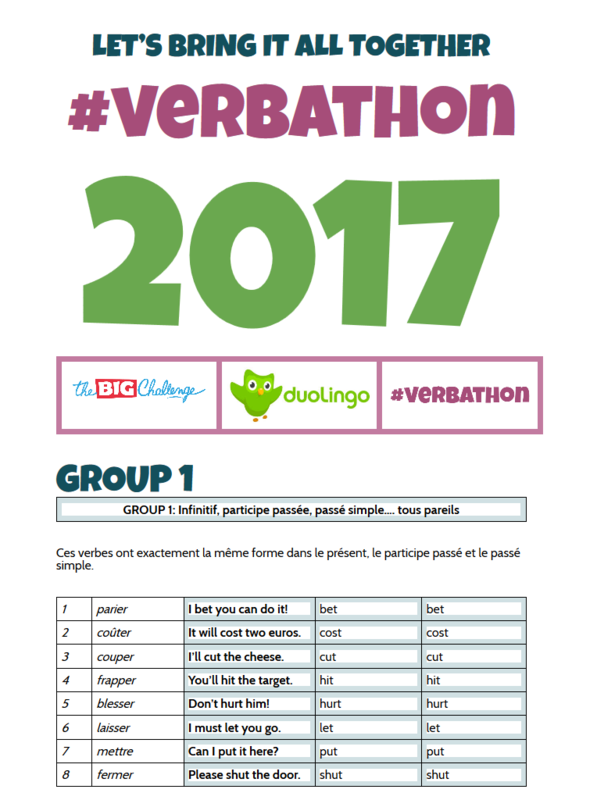 In 6 teams of 4 we play eyes-front wholeclass games that rely on team work and individual responsibility which guarantee spaced repetition and retrieval of the #verbathon verbs until, at the end of the year, 24 students can recognise, use, manipulate and invent new phrases with these most irregular of verbs. Team scores, individual scores and whole class scores cross over and bump into each other in a fantastic inter-class spreadsheet that make success and progress very public and inter-class competition rather feisty. Scores from Duolingo and other platforms are even factored in. Nobody is afraid to make mistakes, everyone has a go, and everyone moves forward. And strangely, everyone in my classroom loves Fridays 🙂 Even me. Click through these slides above to see how teams are managed and scored. Dowload / print the numbered list of verbs here in order that students can keep them in their workbook. This spread sheet enables real-time scoring on the whiteboard (Click to open in new window). Individuals can receive points which are added to the team score. Points can go directly to teams for a team effort. Class scores are totalled and compared for inter-class competitivity. Whichever team is playing, whichever student is answering ALL pupils must right down at least the phrases from the first round. Further rounds and future games will be based on these phrases. 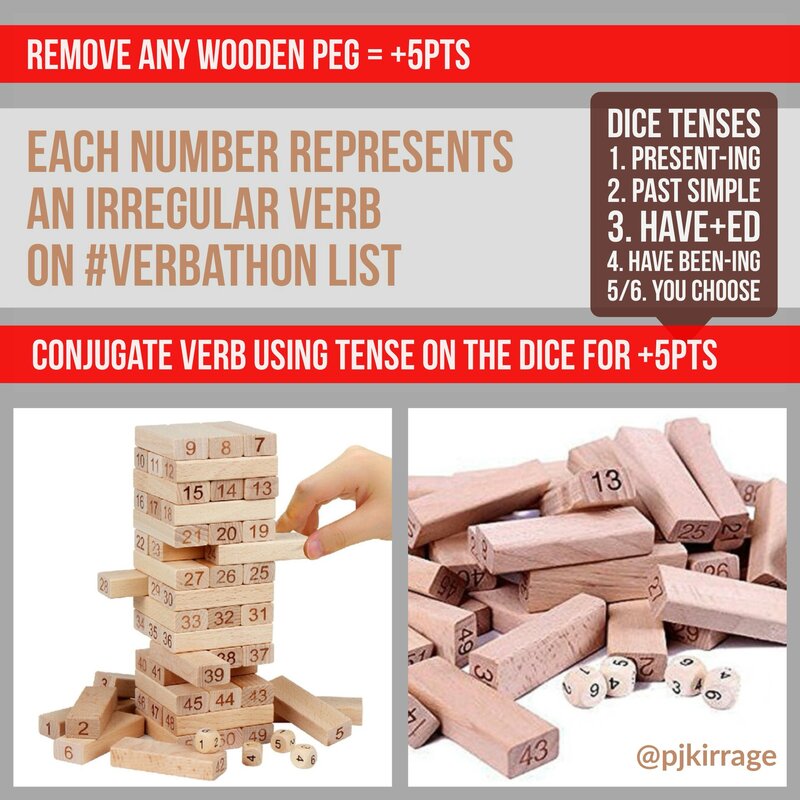 This ensures spaced repetition and retrieval which is the raison d’être of the #verbathon. Open the dominoes in a new page as a printable sheet. 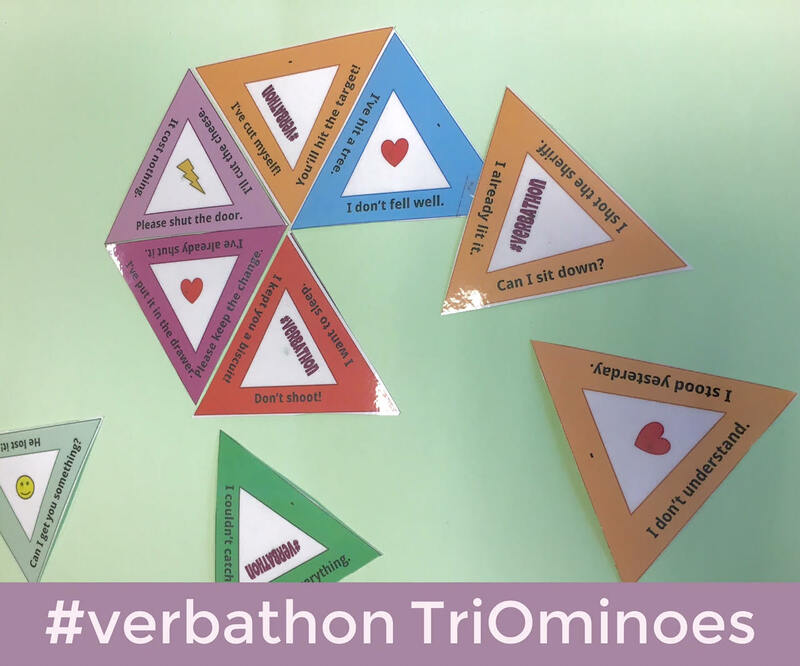 These TriOminoes require students to match a #verbathon verb in a present tense phrase with the same verb in a past tense phrase. The first time teams use the TriOminoes (I’ve printed and laminated 6 sets, 1 per team) I have them simply reproduce the patterns from the above slideshow – which I photocopy – in order that they can get used to how they work. The symbols help pupils find the TriOminoe they’re looking for (a green triangle with a smiley face, for example). Later they can be used as a stopwatch speed activity: first to finish / how many in three minutes etc. This video presents the very first UK episode of Blockbusters from 1983. It is an amusing way to present the rules of the game in class. I need to make these explanations clearer, but flick through the slide to get the idea of this game. Students have to make there RPM and points can be given for the smartest, most colourful etc. Use the menu (or in VR, look at the menu next to your feet) to change seen and vocabulary choices. Students can explore this room in virtual reality using a virtual reality headset. 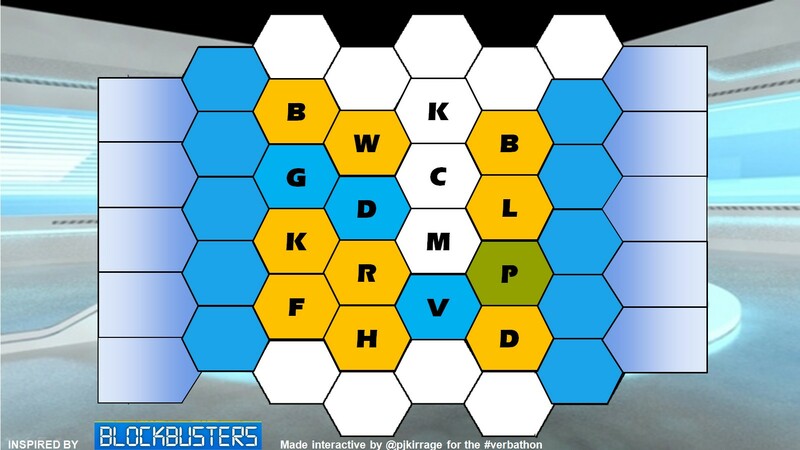 Read throught the above slides to see how the game works then click here to open modifiable version for projection and manipulation on the interactive whiteboard.